The month of February kicks off this Sunday (maybe?) with The Big Game in New York City. While there isn't any local representation at that snow ball fight up north, a big sporting event does hit a lot closer to home February 14th - 16th. The NBA brings All Star festivities to the New Orleans Arena and convention center, where the New Orleans Pelicans will be well represented in several events leading up to All Star Sunday night. Rock 'n' Roll New Orleans Marathon & Half (Sunday, February 2nd @ 7:00am) - The Rock 'n' Roll race series returns to New Orleans for the 5th year, winding through downtown, uptown, mid-city, and lakefront. A finish line erected in City Park is a welcome sight to those tackling the 26.2 / 13.1 miles. If you aren't participating, come out to spectate and cheer on your fellow New Orleanians! Heart & Sole 5K Fun Run (Saturday, February 8th @ 8:30am) - The beautiful course along Napoleon Avenue benefits the Academy of The Sacred Heart. Both 5K and 1/2 mile options are offered to participants. 504K (Saturday, February 15th @ 8:30am) - The inspiring Youth Run NOLA organization presents its first 5.04K race through the Marigny and Bywater neighborhoods. Finishers arrive at Washington Square Park for a celebration of their accomplishment. Participants from at least 19 schools in the region will be involved in the race's planning and execution, however all are invited to run. 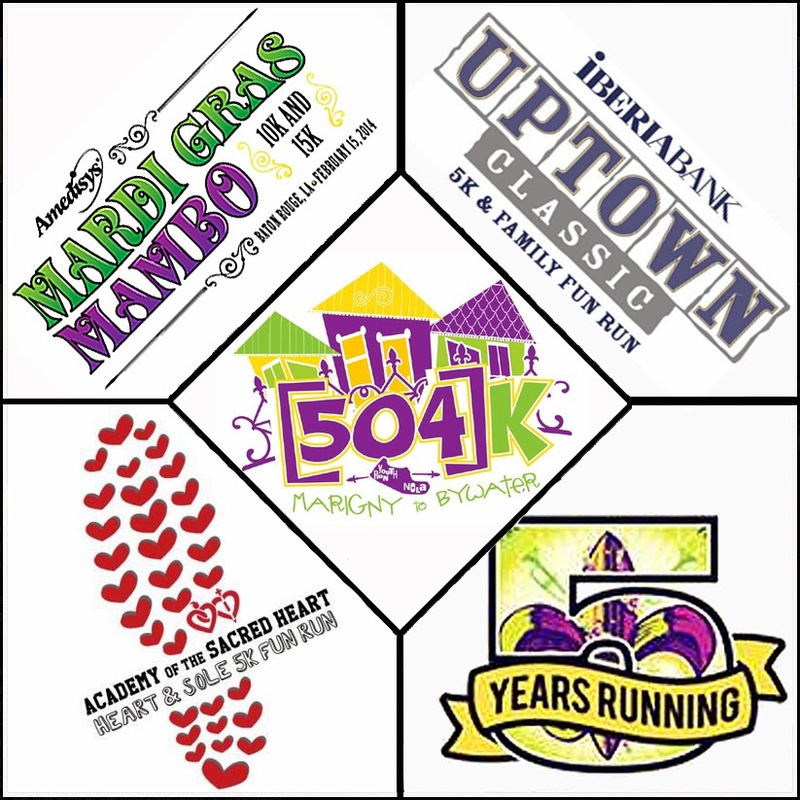 Mardi Gras Mambo 15K & 10K (Saturday, February 15th @ 9:00am) - Just up river in Baton Rouge, Amedisys presents this annual race that now includes a 15K. Race organizers have upgraded the unique finisher medals for this year's participants in the 15K, 10K and 1 mile fun run. Uptown Classic 5K (Sunday, February 16th @ 8:30am) - Presented by Iberia Bank and the New Orleans JCC, the race course for the 5K and 1/2 mile fun run takes participants up and down Prytania Street in Uptown. Take advantage of the Family Registration option to get the entire gang involved.